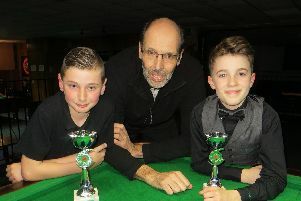 Six players from the Wednesday Junior Snooker League at Waterlooville Sports Bar had something to celebrate this week. Former champion Dean Russell continued his unbeaten start to the fifth season and leads division one by two points. Zak Truscott, who has played a week less, also has a 100-per-cent record and he beat defending champion Samuel Laxton. Laxton equalled his highest break of 41 against Ryan Wilson, who made a personal best 13. Second-placed Tom Shuttle hit a new high of 22 and Harvey Dunsmore increased his best to nine. Henry Martin leads division two while Jayden Brookes heads division three. Meanwhile, Brookes won the round-robin group in the Junior Pool League. And Harry Wilson takes an unassailable 13-point lead into the final week of the Monday Junior Snooker League. Second-placed Truscott won the top group on the head-to-head rule. Josh Richards won his first match. He then won two more and then won a three-way tiebreak to head the second group.